Life is tough. Negativity is all around us. Many of us have experienced failure first hand. Despite the difficult circumstances, every individual has the desire to succeed. If you are in need of an extra push, guidance, or are seeking an encouraging word, this is the book for you. 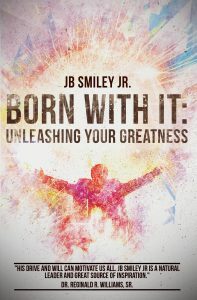 Born With It: Unleashing Your Greatness is groundbreaking in its approach to personal empowerment. It boldly states looking outside oneself for the solutions to personal struggle is not the answer. The answer lies … [Read more...] about Born With It: Unleashing Your Greatness by JB Smiley Jr.
About JB Smiley Jr.: Mr. JB Smiley Jr, an attorney by profession, was born and raised in Memphis, TN. As a student-athlete at Bolton High School, Mr. Smiley excelled in the classroom and on the basketball court. While earning numerous athletic awards, he simultaneously mentored young students and was an exemplar role model. After high school, Mr. Smiley attended Tennessee Technological University “TTU” and the University of Pikeville “UPike”. He went on to play professional show basketball and … [Read more...] about Interview with Author – JB Smiley Jr.